If you're using a MIDI controller with no soundcard or if splitting the decks on an external mixer is a priority, the UDJ6 is great for the price. Plug-and-play. Flexible. Light and sturdy. No inputs. No volume control. 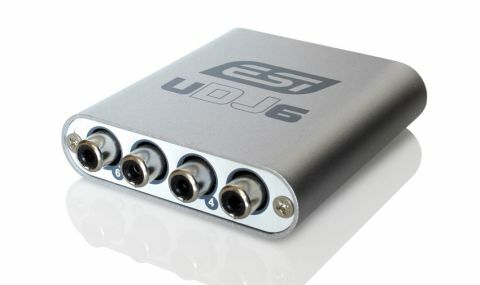 The UDJ6 is a mini monster, offering six channels in a package the size of a large matchbox. It provides six outputs for DJ software, like Traktor, Djay or Ableton, with two RCA outs per channel and a stereo 1/4" jack for headphone cueing. Light yet sturdy, there are no inputs but this has been designed for use as a middleman between your software and mixer. "The UDJ6 allows you to separate decks A and B into two stereo channels on the mixer offering flexible routing for effects and EQ"
The NI Audio 2 DJ is similar in size and price, so let's compare it to that for the sake of this review. The main difference is that the Audio 2 DJ only offers four channels: a stereo master out and a stereo cue, both via 1/4" jack. The UDJ6 allows you to separate decks A and B into two stereo channels on the mixer, for example, offering more flexible routing for effects and EQ. If you're used to an external mixer or prefer the EQs on a certain board than those inside the software, the UDJ6 is the better option. Unlike the Audio 2 DJ, the UDJ6 has no volume control. This is its main downfall as if you did decide to use the UDJ6 to cue, you'll need to map a MIDI controller to the software to control mix and cue volume. Finally, the plug-and-play and bus-powered nature means there's no faffing.